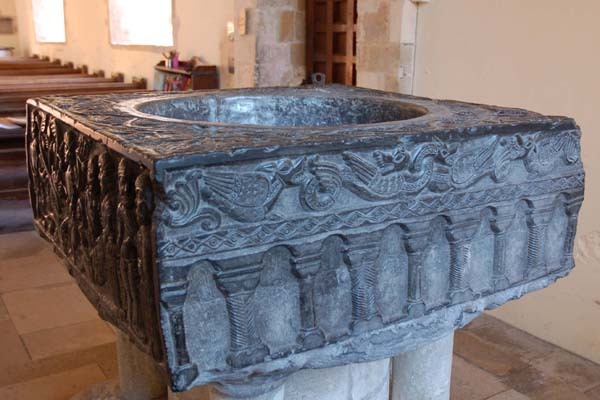 The Tournai font, originally placed in the south transept but moved to the west end when the transept was rebuilt. God creates Adam, and then Eve from Adam's rib. Eve is tempted to eat the apple, and in turn tempts Adam. West side. 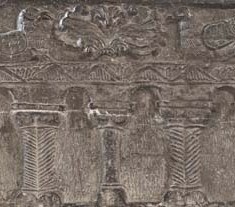 Despite the teaching in the Church that the earth was a sphere, on the west side of the marble the sculptors of Tournai prefer to show the world as flat, resting on a series of pillars and arches and above on the surface of the ground mystical beasts which represented the real-life creatures from the reptiles to the birds, which God had created. 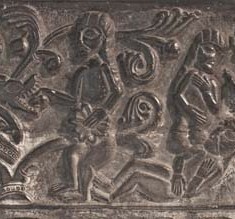 Adam and Eve are expelled from the Garden of Eden. 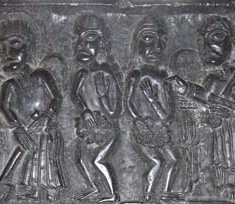 On the right, Eve is taught to spin and Adam to dig. South side. The flat earth once again resting on pillars, whilst God's creatures now include a dog and a rabbit. The greatest treasure of the church is the font. It is one of only seven such fonts in this country, made from black Tournai marble in what is present-day Belgium. It came here around 1150, just as the original church was being completed. It was probably a gift from the then Bishop of Winchester, Henry of Blois, grandson of the Conqueror, brother of King Stephen and Chancellor of England, who was known for his generosity with regard to his churches. 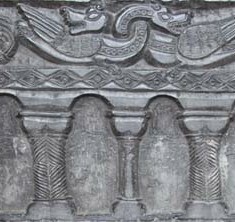 Click here for an article by John Mackinlay on the Tournai Font, in the East Meon History website.